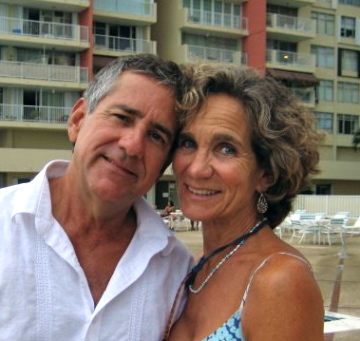 Our lives have been intertwined for around thirty-three years. It would be more of a chapter-book approach if I attempted to recount all of our days. Friends such as these are more like a part of our family. Even their four kids and our two love each other like siblings and stay in touch. Susan is the type of girl that cuts right to the chase... I like that. If she begins a sentence with, "I have something to tell you, in love..." you know it may hurt a bit. She is someone I know I can trust. Whenever we all get together, it is as no time has passed. As our children grow up and the families change with weddings and babies, we simply add to our large circle of love. Susan's tortellini recipe is one of our all time faves. 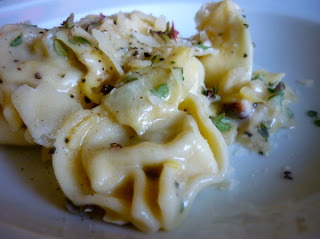 I tweaked it a bit with the addition of lemon zest, thyme and wine. 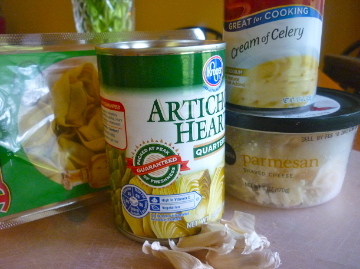 You need only three main ingredients: a can of artichoke hearts, cream of celery soup and tortellini. You should have the other stuff on hand. What could be simpler? Place a large deep pot of water on for pasta. When water boils, add a generous amount of salt. Cook tortellini according to package directions. In large skillet, saute garlic in olive oil. Add chopped artichoke hearts and cook for a few minutes. Add remaining seven ingredients and simmer for five minutes. 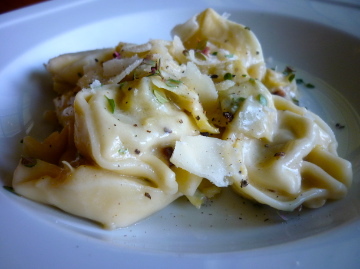 Toss with cooked tortellini. Thin with a drizzle of pasta water. Serve immediately, passing additional parmesan on the side.